What mistakes are you making when you brew your coffee? Although Huffington Post gave these hints almost a year ago (last April) there is some great information here as to why your coffee may be bitter, or flavorless or just 'off' somehow; leading you to think you can't brew good coffee and also leading you to spend $5 every morning at the local coffee shop on your way to work! Love these hints... do you see YOUR coffee mistake listed? 2 ) Overheating the water. 3 ) Ignoring the magic ratio. 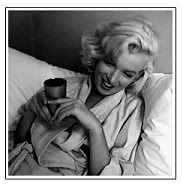 4 ) Using pre-ground coffee. 7 ) Freezing coffee beans. I'm loving the Reindeer Blend Coffee (k-cups) from Caribou!!! This week I have a favorite coffee... Caribou Coffee, Reindeer Blend. 100% Rainforest Alliance certified Reindeer Blend brings together coffees from Central America combined with heavy-bodied and rich flavors from Indonesia - including a rare, aged Sumatra that gives a hint of caramel and a dash of spice. The important thing to point out is you cannot taste any spice or caramel... it's so well blended and just a 'hint' that all you really taste is a very good, bold yet not bitter or too strong coffee. I got mine at Target this week, but if you can't find it locally you can order it online yet. Either on the Caribou website or at Amazon. (Here for Amazon link: Caribou Coffee, Reindeer Blend. ) I know it will disappear after next week (Christmas) so I honestly am thinking of picking up 2 or 3 boxes. It's my first choice for coffee right now even though I have 4 different blends/brands in the house. I'm off to brew another cup right now as a matter of fact. If you can pick it up locally, I'd suggest giving it a try. The online price of $19.99 is a little steep - and you should be able to find it in your local stores for about $11. A great Christmas Gift Idea: A Kuerig Coffee Brewer - OR a nice selection of k-cups! Ever have something so obvious and right in front of your face that you miss it? I believe it's 'can't see the forest for the tree's'? I just did that with this blog post. It never occurred to me to post about COFFEE AS CHRISTMAS GIFTS even though, guess what we are giving my father-in-law this year? Hellloooo? Last year we bought my father-in-law a Keurig Home-Brewing System. My FIL was 85 years old, liked just one or two cups a coffee a day but wouldn't make it as he didn't want to 'make a whole pot' and waste it. Yes, he could have made a half pot of 4 cups, but we won't go there. Suffice to say we decided to purchase a single cup brewing system for him as he had used it numerous times at our home over the past 7 years and was familiar with them. I also bought him (at the time) boxes of k-cups in a variety of options; coffee, hot chocolate, tea, and even apple cider. Because you can purchase k-cups almost anywhere; from department stores, to grocery stores, discount stores, membership stores to electronics stores like Best Buy... even online; it's not hard to find them. Yet apparently, my FIL must not purchase them. This year when I asked him for a few idea's for Christmas gifts he would like to receive, one of his first responses to me was "a box of those k-cups for my coffee maker". This year my siblings and I went together to get a Keurig brewer for our parents, along with the reuseable cup for regular ground coffee and 2 large 80 count boxes of coffee. A good set up that they will be thrilled with and will keep them in coffee for a couple months before they have to purchase. There are coffee companies you set up automatic delivery through as well. I used to have automatic delivery every 6 weeks but stopped as it was just as easy for me to buy my coffee as I am at various stores selling it at least once a week. For people like my FIL however or someone on your list that is elderly, confined to home or just enjoys a gift of coffee, this is a great idea. Just the like Christmas carol croons... baby it's cold outside! And with colder weather comes a craving for flavored coffees. I have a hard time with flavored syrups in my coffee because I don't want something sweet, but I want enough of a sweetner to enhance and just barely bring out the flavor. For this reason I typically buy flavored syrups over flavored coffee so I can add the amount I wish. Another reason I keep flavor syrups on hand is I don't just use them for coffee. Peppermint, almond and vanilla are always on hand for cookie and dessert baking, flavoring whipped creams and cheesecake, hot milk, iced lattes and more. I use the brown sugar cinnamon and pumpkin spice to flavor our holiday hot, buttered, spiced carrots as well as baking, pies and desserts. The raspberry and grape flavors make great instant icee's. As you can tell, we use flavored syrups for a lot of things around our house! Tonight I was bored and surfing around Amazon when I came across a new (to me) brand. Amoretti syrups. Made in Southern California (my old stomping grounds!) and since they are more concentrated with less watery fillers than other brands, you use less; thereby getting more for your money. I have not used nor tried this brand, but the reviews look positive and the customer service of the company seems to be top notch. Amoretti Premium syrups are sophisticated, complex, concentrated and spicy takes on the traditional holiday flavors. Use our premium Holiday Syrups to make your holiday drinks just a little more special. Add Amoretti Premium Eggnog Syrup to a cup of coffee to get the rich and creamy flavor of eggnog blended with a robust cup of coffee, for just 35 calories per serving. A delicious homemade cinnamon dulce latte is just a tablespoon or two away, or relax by the fireplace with some delicious cinnamon tea. Amoretti Premium Gingerbread Syrup combines the predominantly zesty flavor of ginger with rich honey and molasses to bring you the unique flavor and aroma of a delicious gingerbread tea. Relax by the fireplace with yummy chai tea, or, although not traditional, Amoretti Premium Chai Syrup can be used to flavor coffee drinks. Chai lattes are readily available in coffee houses all over North America. Amoretti Premium Nutmeg Syrup is delicious over waffles, pancakes and French toast, either straight or blended with maple syrup. Add it to your basic cake batter, cookie dough, or frosting recipe to create delectable nutmeg flavored desserts, or use it in place of vanilla to give your whipped cream topping a distinctive and delectable flavor twist. Lace coffee, tea, or any holiday drink with Amoretti Premium Pumpkin Spice Syrup. Add it to cake batter, cookie dough, or a cheesecake to add a unique flavor to your holiday culinary treats. I like my coffee extra hot, strong and black. Usually. Once the cold weather of the tail end of autumn, start of winter arrives, my body sometimes craves flavored coffee. Mainly, a minty coffee. My typical fall/winter purchase has been to pick up some Millstone Peppermint in the store on my regular grocery trips. Although I use my Keurig and k-cups every day, when I make flavored coffee (or have guests who are heavy coffee drinkers and would go through `12 k-cups in 1 day) I get out my regular Hamilton Beach coffee maker. (It's this one for those who may wonder; Hamilton Beach Brewstation Coffeemaker ) Because I only purchase whole beans and ground coffee once in a while (compared to daily k-cups), I'm not sure when it happened, but the Millstone display at my local grocery store was greatly diminished. They still had a grinder available, but only four or so coffee's. No worries. I saw Eight O Clock Chocolate Mint Ground Coffee available so in the basket it went. My husband likes flavored coffee even less than I do and never, ever drinks it. However, upon going through the cupboards that evening to see what I got at the store, he picked the coffee out of the cupboard, squeezed it, inhaled the chocolate mint aroma from the little seal on the bag and exclaimed; "Mmmm! This is the only flavored coffee I like. I love when it starts to get cold out and you buy the peppermint coffee's." This morning, the Eight O'clock Chocolate Mint is in my cup. It's smooth, not bitter, and has a hint of chocolate mint cookie. I don't like my coffee sweet so I add barely a smidgen of sweetener to it juuuuust enough to heighten the aroma and flavor but not enough to actually make my coffee sweet. For most people however, a touch of sweetener and even a little cream would make this coffee a perfect, chocolate mint drink similar to one you would pay $4 for at a coffee house on your way to the office. JOLT! Engergy Gum - Why I Haven't Seen this Stuff Before Now? Just last week my husband asked if I remembered when the soda "Jolt" first came out. I kind of did... but as a kid and teen I didn't drink much soda so it's not something I rushed out to buy or try. My husband said he and his friends would have one every day after football practice. Good thing since before he was old enough to drive, he had to ride his 10-speed bike home from football and baseball practice, on gravel roads, about 9 miles. AFTER football practice. When he was exhausted. He was laughing as he reminded me of the original slogan - "All the sugar and twice the caffeine" being touted for the soda... which is a huge 'no no' today when marketers are trying to downplay the sugar in their products. So anyway... where was I? Oh yes. I thought of that conversation when I saw JOLT GUM being offered on Amazon. Available in spearmint and icy mint, the gum is sold in convenience stores, on military bases, and online. Same Jolt as Jolt Cola! "As a college student, I have used jolt gum for a few years as the ultimate study aid for late-night binge sessions." "...it's my go-to source of quick caffeine when I'm working night shift." "This gum is in my car always." Admittedly, at first I didn't think this was a product I would consider buying, simply because I happen to like coffee. But reading the reviews (some of which I quoted above) I realized for all the cross country drives I do, the afternoon 'brick wall' I hit around 2:pm as well as staying up late to watch a movie with my husband when I'd much rather be sleeping... yes, I guess the "Chew More, Do More" gum would come in handy. Caffeine Brownies? Yep! You can eat your morning coffee now. You know what happens when life gets busy? Sometimes you forget some awesome little coffee or caffeine related products that meant to blog about... but you tucked away in the draft file!!! This is one of 6 really fun, new products I found a few months ago and wanted to blog about but then... um, life got in the way! I've linked their company name to their order site and linked their FB page too. I don't know anything about the taste of the product as I haven't tried it and I just found out about it by surfing the net, but hello? It's a brownie. How can you go wrong with a caffeine brownie!? They apparently sell brownies, cookies, muffins and more. Get Up And Go, founded in 2012 by University of Michigan grads Chris Bogdan and Zach Rose, makes caffeinated baked goods such as brownies, cookies, and muffins. 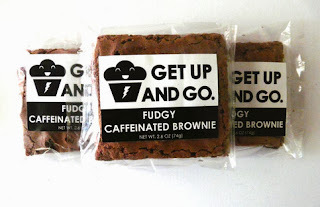 The moist, fudgy brownies have natural caffeine extract. The Ann Arbor company is working on getting the goods distributed nationwide. “We’re trying to inspire people to get up and go do what they love,” Bogdan says. You can visit their Facebook page here.